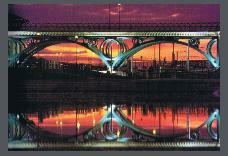 The Practice has been responsible for the Design and Master Planning of prominent sites in Scotland and England. Working for Teeside Development Corporation the former steelworks at Stockton has been imaginatively converted into a new Waterside mix of Leisure, Commercial, Housing and a new University Campus. The work included the new Tees bridge shown. The first major office block was also designed by the practice fronting the river Tees. 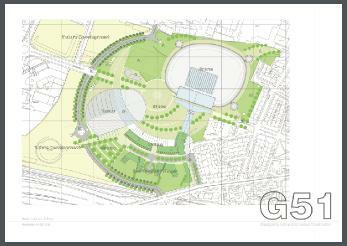 G51 is a Vision for redevelopment around Ibrox Stadium with new Conference and Exhibition centre, 2 Hotels, Sports related shopping plaza and major new Housing centred around a landscapes sequence of public and private spaces. Master Planning has involved Residential, Leisure, Commercial and both Public and Private clients and uses.